Def Leppard, in many ways, was the definitive hard rock band of the ’80s. There were many bands that rocked harder, and were more dangerous, than the Sheffield quintet, but few others captured the spirit of the times quite as well. Emerging in the late ’70s as part of the New Wave of British Heavy Metal, the group actually owed more to the glam rock and metal of the early ’70s — their sound was equal parts T. Rex, Mott the Hoople, Queen, and Led Zeppelin. By toning down their heavy riffs and emphasizing melody, Def Leppard was poised for crossover success by 1983′s Pyromania, but skillfully used the fledgling MTV network to their advantage. The group was already blessed with photogenic good looks, but they also crafted a series of innovative, exciting videos that made them into stars. They intended to follow Pyromania quickly but were derailed when their drummer lost an arm in a car accident, the first of many problems that plagued the group’s career. Def Leppard managed to pull through such tragedies, and they even expanded their large audience with 1987′s blockbuster Hysteria. As the ’90s began, mainstream hard rock shifted away from Leppard’s signature pop-metal and toward edgier, louder bands, yet the group maintained a sizable audience into the late ’90s and were one of only a handful of ’80s metal groups to survive the decade more or less intact. Following the release of Getcha Rocks Off, Rick Allen was added as the band’s permanent drummer, and Def Leppard quickly became the subject of the British music weeklies. Soon, they signed with AC/DC’s manager, Petter Mensch, who helped them secure a contract with Mercury. On Through the Night, the band’s full-length debut, was released in 1980 and instantly became a hit in the U.K., also earning significant airplay in the U.S., where it reached number 51 on the charts. Over the course of the year, Def Leppard relentlessly toured Britain and America, including opening slots for Ozzy Osbourne, Sammy Hagar, and Judas Priest. High ‘n’ Dry followed in 1981, and it became the group’s first platinum album in the U.S., thanks to MTV’s strong rotation of “Bringin’ on the Heartbreak.” MTV would be vital to the band’s success in the ’80s. As the band recorded the follow-up to High ‘n’ Dry with producer Mutt Lange, Pete Willis was fired from the band for alcoholism, and Phil Collen, a former guitarist for Girl, was hired to replace him. The resulting album, 1983′s Pyromania, became an unexpected blockbuster, due not only to Def Leppard’s skillful, melodic metal, but also to MTV’s relentless airing of “Photograph” and “Rock of Ages.” Pyromania went on to sell ten million copies, establishing Def Leppard as one of the most popular bands in the world. Despite their success, the band was about to enter a trying time for their career. Following an extensive international tour, the group re-entered the studio to record the follow-up, but producer Lange was unavailable, so they began sessions with Jim Steinman, the man responsible for Meat Loaf’s Bat Out of Hell. The pairing turned out to be ill-advised, so the group turned to its former engineer, Nigel Green. One month into recording, Allen lost his left arm in a New Year’s Eve car accident. The arm was reattached, but it had to be amputated once an infection set in. Without a drummer, Def Leppard’s future looked cloudy, but by the spring of 1985 — just a few months after his accident — Allen began learning to play a custom-made electronic kit assembled for him by Simmons. Soon, the band resumed recording, and within a few months Lange was back on board, but once he joined the team, he judged the existing tapes inferior and had the band begin work all over again. The recording continued throughout 1986, and that summer, the group returned to the stage for the European Monsters of Rock tour. 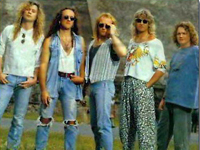 Def Leppard finally completed their fourth album, now titled Hysteria, early in 1987, releasing it that spring to lukewarm reviews; many critics felt that the album compromised Leppard’s metal roots for sweet pop flourishes. The record was slow out of the starting gates — “Women,” the first single, failed to really take hold. But with the second single, “Animal,” Hysteria began to take off. It became the group’s first Top 40 hit in the U.K., but more importantly, it began a string of six straight Top 20 hits in the U.S., which also included “Hysteria,” “Pour Some Sugar on Me,” “Love Bites,” “Armageddon It,” and “Rocket,” the latter of which arrived in 1989, a full two years after the release of Hysteria. During those two years, Def Leppard was unavoidable — they were the kings of high-school metal, ruling the pop charts and MTV, and teenagers and bands alike replicated their teased hair and ripped jeans, even when the grimy hard rock of Guns N’ Roses took hold in 1988. Hysteria proved to be the peak of Leppard’s popularity, yet their follow-up remained eagerly awaited in the early ’90s as the band set to work on the record. During the recording, Steve Clark died from an overdose of alcohol and drugs. Clark had long had a problem with alcohol, and following the Hysteria heyday, the band forced him to take a sabbatical; he did enter rehab, but to no apparent effect. In fact, his abuse was so crippling that Collen had to play the majority of the guitar leads on Hysteria. Following Clark’s death, Def Leppard resolved to finish their forthcoming album as a quartet, releasing Adrenalize in the spring of 1992. Adrenalize was greeted with mixed reviews, and even though the album debuted at number one and contained several hit singles, including “Let’s Get Rocked,” “Have You Ever Needed Someone So Bad,” and “Make Love Like a Man,” the record was a commercial disappointment in the wake of Pyromania and Hysteria. After the release of Adrenalize, the group added former Whitesnake guitarist Vivian Campbell.